Our air filter subscription service is easy. Simply select your plan, the delivery frequency, and get your air filter delivered to your door on time! Our Premium filter option is our most popular air filter subscription. Our Premium filter protects your home against dust, lint, mites, pet dander, pollen, dirt, mold, smoke, smog, bacteria, and virus carriers—some of the most common allergens and air particles that enter the home on a daily basis. Our Premium filters traps allergens as small as 1.0 microns, giving you premier filtration that is perfect for families and homes of all sizes, and one of the best values for your money. Our air filter subscriptions are the perfect solution to your needs. Never forget to change your air filter and save yourself a trip to the store in the process. Not only are our filters the top quality, manufactured in the United States by Flanders Corporation, but they are less expensive than store brands. Save money with our most popular subscription option, and see energy savings with regular filter replacement. Think simple with Simple Filter Plan and our air purifier and filter subscription options. 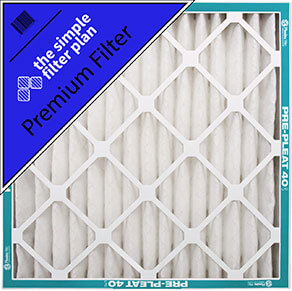 Keep yourself healthier with our Premium option and explore our other filter plans for different filtration options! You’ve selected the Premium Filter. It’s the perfect balance of filtration and air flow—clean air at a nice price. Not what you had in mind?